Tonight is the big night, Super Bowl XLVI (46), and you can’t have a football game without snacks. So whether you’ll be cheering on your favorite team, picking your favorite commercial, or waiting to see what Madonna will do during her halftime performance, you’ll be deciding which snack to munch on the most. I thought I would pull together 10 of my favorite snacks from over the last few years. Some of the pics aren’t that great (the little PowerShot that could), but the food is definitely a must try. Who will you be cheering on? I know I’m excited to see what the Queen of Pop will be conjuring up. I also want to some additional ideas for my get together tonight so let me know what your favorite snacks are in the comments below. All season long I’ve had the pleasure of posting my recipes on Reality Rocks, by the fabulous, Lyndsey Parker. Today I’m proud to announce my finale recipes were featured on Yahoo! Music’s home page! 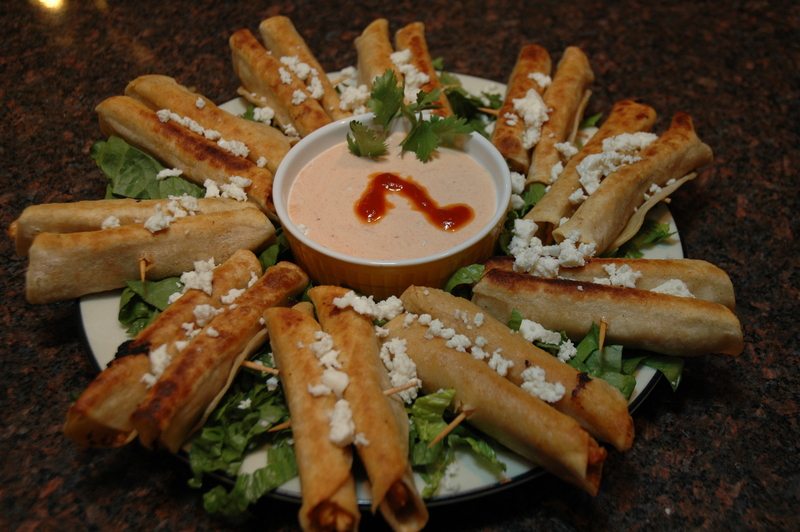 So take a look at recipe number three, Flautas with Adobo Chile Crema! Give these recipes a try, I promise you won’t be disappointed! Who do you think will take home the Idol crown tonight?